Throat cancer, also known as cancer of the larynx, is an uncommon form of cancer. A number of factors might contribute to its development, including smoking, drinking alcohol and exposure to air-borne pollutants, although U.K. health information website, Patient UK, notes that it can develop for no apparent reason. Throat cancer is commonly treated with surgery, radiotherapy or chemotherapy, or a combination of these treatments. Some herbs, including green tea, might also have anti-cancer effects, but should not be used in place of conventional cancer treatments. Consult your physician before using herbal remedies. Although often referred to as Chinese or Japanese tea, green tea is an herbal beverage enjoyed in many parts of the world and is also prized for therapeutic effects. The Memorial Sloan-Kettering Cancer Center notes that it is sometimes used as a complementary treatment for a host of ailments including gastrointestinal disorders and high cholesterol. It might also play a role in the prevention and treatment of cancer and may work by inducing cancer cell death. Scientific research into the effects of green tea on throat cancer is lacking. However, the results of laboratory study published in 2003 in "Folia Histochemica et Cytobiologica" show that the green tea compound, epigallocatechin-3-gallate, inhibits the growth of laryngeal cancer cells. Subsequent study findings published in the September 2009 issue of "Archives of Pharmaceutical Research" confirm these effects. However, clinical trials evaluating green tea's efficacy are required to determine how effective it might be in supporting throat cancer treatment. Green tea is commonly consumed as a beverage, but green tea extract is also available in capsules for health-food stores. Since green tea is a not a proven treatment for throat cancer, there is little guidance available regarding a suitable dose. 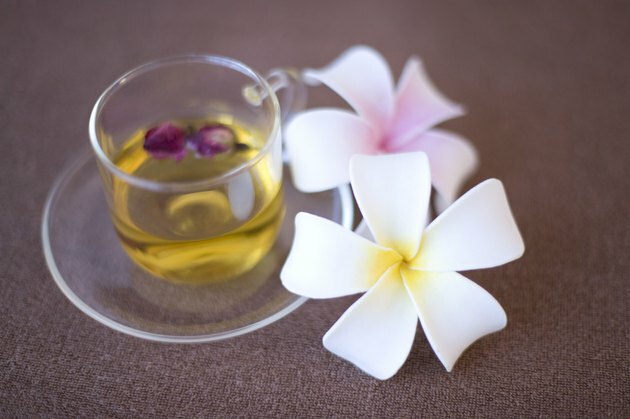 However, MedlinePlus notes that a typical therapeutic dose of green tea is three cups daily. Ask your doctor for advice regarding a suitable dose for you. Consuming more than five cups of green tea daily may cause side effects including tremor, restlessness, insomnia, headache and nausea. It might also interact with other drugs you might be taking, including oral contraceptives, anticoagulants and antibiotics. The Memorial Sloan-Kettering Cancer Center notes that it might also negate the effects of the anti-cancer drug, bortezomib. If you are taking this drug, avoid green tea.